Macs don’t get much love in the forensics community, aside from @iamevltwin (Sarah Edwards), @patrickolsen (Patrick Olsen), @patrickwardle (Patrick Wardle), and a few other incredibly awesome pioneers in the field. We see blog posts all the time about Windows forensics and malware analysis techniques, along with some Linux forensic analysis, but rarely do we see any posts about Mac technical/forensic analysis or techniques. I find this odd, considering the surge in usage and deployment over the last several years, particularly within enterprises. Well, with my most recent two part Mac post as well as this one, I’m attempting to change this, my friends! Macs need love and disk/memory analysis as well, amirite? Let’s have a look at memory acquisition of OSX systems using a nifty tool called OSXpmem. OSXpmem is a part of the pmem suite created by the developers of Rekall. Rekall itself is actually a very useful utility built for both memory acquisition and live memory analysis on Windows, Linux, and OSX systems. While I will be delving into Rekall in a future post, for this we will simply be focusing on OSXpmem, which is an awesome command-line utility for quickly and easily collecting RAM from a Mac system. One of its greatest features is its output to an AFF4 volume, which has a ton of useful features (likely to be discussed in a dedicated post in the future as well). So, what’s the easiest way to get up and running with the tool for memory acquisition? Download latest release (as of this post, the latest osxpmem release is “2.1.post4”). /Users/jp/Projects/osxpmem.app/MacPmem.kext failed to load - (libkern/kext) authentication failure (file ownership/permissions); check the system/kernel logs for errors or try kextutil(8). How usefully nondescript. Let me save you some time, as searching the system/kernel logs as suggested yields nothing useful. YES! It worked! As you can see, my system has 8GB of memory that was (by default) exported to an AFF4 volume/file called “mem.aff4”. You also have the option to include additional local files within the resulting AFF4 volume/file via the “-i </path/to/file> -i </path/to/file> …” command line option(s), which can be useful in producing a singular output volume containing not only memory but other files (binaries/logs/etc.) you’d like to analyze as well. In the past, I used this option to collect the local /bin/bash file when Volatility used to require the bash shell’s memory address be provided in order to parse command history and produce associated timestamps when using the linux_bash plugin. Though the documentation still shows it as a requirement, it’s actually not needed anymore and parses it all just fine. In addition, you may also export the memory image to a singular RAW or ELF file by using the “–format elf” or “–format raw” command line options if that suits your fancy. However, for this post, I am using the default AFF4 output so that we may explore its use and features a bit. So, without further ado, let’s take a look at the resulting AFF4 volume/file. Here, you can see that we extracted a memory image to the AFF4 stream “7f482355-5683-46bb-87c0-21afd75dbbeb/dev/pmem“. As you can see, the raw image is uncompressed and thus substantially larger than the AFF4 volume (one of the useful features of AFF4 is its compression options). Nonetheless, there you have it. A raw memory image to parse to your heart’s content with whatever tools you like. However, before we move on, I personally like to unload the kernel extension for one last good measure so that it’s not just hanging out there for no purpose. Acquiring a memory image is great, but unfortunately is useless (with respect to Volatility) without the appropriate profile to parse it. Volatility requires a memory profile be specified when parsing a memory image via the “–profile=<profile>” command line option. By default, Volatility includes a ton of profiles for Windows, but such is not the case for Linux and Mac. Though a profiles repository has been created containing a substantial set of profiles for Linux and Mac, YMMV. In my situation, I’m running the latest MacOS Sierra release 10.12.3, for which no profile existed as of this post (nor did it for 10.12.2 until I created and submitted one to the repo as well :D). Therefore, I had to create my own profile. Luckily, the folks at Volatility do a great job walking us through building a profile on a Mac. Though, there are a few clarifications I’d like to address. “To create a profile, you first need to download the KernelDebugKit for the kernel you want to analyze. 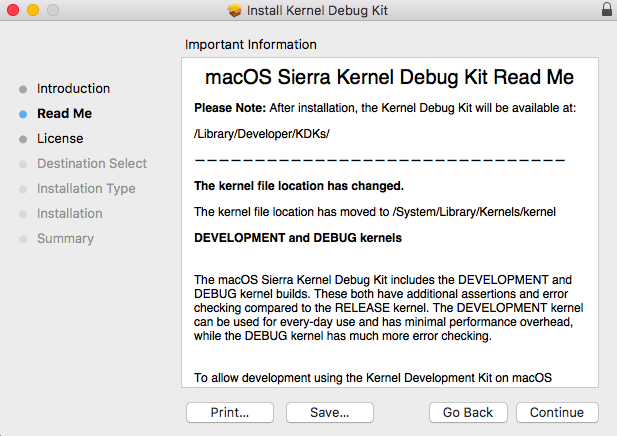 This can be downloaded from the Apple Developer’s website (click OS X Kernel Debug Kits on the right). This account is free and only requires a valid Email address. As of current, for macOS Sierra 10.12.2 and 10.12.3, the <version> will be “10.12.2_16C67” and “KDK_10.12.3_16D32.kdk“, respectively. Get the dwarf debug info from the kernel. $ python vol.py --info | grep "A Profile for Mac"
**Note: While I append “x64” or “64bit” to my various output files to keep track of which architecture build I’m producing, doing so for the final .zip output file yields profile names with rather weird-looking duplicate 64-bit identifiers (e.g., “Mac10_12_3_64bitx64”). If you would like cleaner looking profile names (at the cost of losing the filename identifier denoting the arch build), you should instead drop the trailing identifier and provide a name the file like the following “10.12.3.zip”, thus yielding a prettier (IMO) profile name like “Mac10_12_3x64”. Once we have successfully created the appropriate profile for the acquired image, we can now use the plethora of native Volatility Mac OSX plugins provided to us for analysis. $ python vol.py --info | grep "mac_"
$ ./volatility_2.6_mac64_standalone --info | grep "mac_"
That pretty much wraps it up for this post. There is certainly more to explore with OSXpmem, the AFF4 format, and Volatility. However, I encourage you to explore it on your own as I would like to save some feature exploration for future in-depth posts focused on using both Volatility and the Rekall suite. JP, you mention running the 2.6 standalone and searching for “mac_” plugins. However, it appears that the standalone doesn’t include any OSX profiles. How would this ever work? Just a quick thank you for the sierra profiles. You’re very welcome. Thanks for the thanks! Hello! I’ve got my removable drive formatted as HFS+, but when I chown -R root:wheel osxpmem.app/, the permissions remain as “_unknown”. How do I remedy this? I have been trying to get this done over a year ago with no luck. I spent many hours trying to get a profile created then and was also assisted by the Volatility team without being able to create my own profile in the end. I then gave up. Today I had an new issue to solve, came across your post, and your steps to creating a profile for the latest version of OSX worked like a charm, the first time around. Awesome. Thanks for the feedback, and glad this post could help! /Users/peppespe/Downloads/osxpmem.app/./MacPmem.kext failed to load – (libkern/kext) system policy prevents loading; check the system/kernel logs for errors or try kextutil(8). Thanks for the message. What you are unfortunately experiencing is OSX SIP (System Integrity Protection). Apple has implemented this as of El Capitan (onward) which over the years has disabled various functionality, currently disabling direct memory reads via kernel extension (kext) even as root. At this point, there is no current workaround or solution other than using MacQuisition to acquire RAM (which requires a reboot and may lose some data). Check out @BriMorLabs’ recent Twitter and blog post about the issue here. With all the recent major (and minor) changes to MacOS, it doesn’t surprise me that one day something works and the next it doesn’t. Unfortunately, it’s really hard to diagnose those kind of issues over the internet, especially as we’re all trying to keep up with the pace of updates from Apple and substantial changes/evolution in OS security. If possible, I’d suggest posting an issue to the Rekall github page to see if they can directly assist. Did you have that error too? Sorry, I have not. Though, my first instinct is to check if it’s a python version issue (code written in 2.x and your local python version is 3.x, or vice versa). Aside from that, your best bet for troubleshooting such issues would likely be to post a Github issue for the code.